The good: Imagine taking a summer road trip with your best friend who just happens to be a famous [insert your favorite genre of music here] star. I don't know about you, but that sounds like the best possible summer vacation I could have as a teenager. Heck, even now! Reagan O'Neill is trying to bounce back from a (literally) painful break-up, drink and party less and focus on the important things. Like getting into college for photojournalism and spending time with her best friend, Lilah Montgomery, aka country music's rising star. Lilah (better known as Dee to her friends) is headlining a tour for the first time and nursing a broken heart herself. And nothing, in my opinion, heals a broken heart quite like your best friend, which these two definitely agree with. It's going to be a summer to remember in both their eyes and I loved being along for the ride. Because of course, it was not a smooth ride at all. Reagan has got to be one of the most refreshing female voices I've read in YA contemporary in a very long time. Her most admirable quality (and Dee's) is their fierce love and loyalty to each other. Reagan is confident yet vulnerable, seemingly unsentimental but cares deeper than people realize, intelligent, witty. She's flawed and she knows it. But she doesn't apologize for her mistakes. Instead she acknowledges them for what they are -- mistakes -- and is now doing her best to move forward and make some vital changes in her life. That's not an easy thing to do and I admired her determination despite certain temptations (I'm looking and drooling at you, Matt Finch). Reagan's friendship with Dee provided not only an amazing portrayal of best friends (one of my favorite YA BFFs, for sure) but insight into celebrity life. Dee is a talented, genuinely kind, down-to-earth girl. She's living her dream and it's obvious she's thankful for it. But the price of stardom can be high. Every move is dissected by the public eye, false scandals pop up left and right and having a boyfriend while in the spotlight is practically impossible. I can't imagine how hard that must be. That's what made Reagan and Dee's friendship so great. Through the mess, they still have moments filled with laughter, music and honesty. They keep each other grounded. Now, onto the romance. Matt Finch, you guys, Matt freaking Finch. Can we say new book boyfriend? He is the quintessential good guy. He has things he's dealing with too but he manages to find constructive ways to handle it. Primarily through music, which is why becoming the opening act for Dee is perfect. Matt and Reagan immediately have chemistry, although she tries very hard to fight it while he continues to be adorable. I loved the banter and natural development of their relationship. I can't tell you how many moments had me grinning to myself. Get ready for the swoons! (No) reservations: My only reservation is my sadness that the songs featured in this book aren't real. Can someone record them, please? Do I recommend? : Yes, yes, yes! This was my first 5 star rating for a contemporary book this year and I can't say enough how much I loved it. It was exactly what I needed at the time and I highly recommend that you check it out. I already pre-ordered my copy! What song would describe your life? Which celebrity performer would you want to go on tour with? Sara Bareilles. I've seen her in concert three times now, I follow her on Twitter and Instagram and one thing is abundantly clear - she is awesome and hilarious and would make for a great BFF. When I thought about this question, she was the first person that came to mind. Love this review! And loved this book. Like I tell everyone, the book is EVERYTHING! I still want to hug it. So glad you loved it as much as I did! This was my first 5 star contemporary read of the year too and it was SO good! I loved it all. The summer-y atmosphere, the road trip parts(and I'm not a huge road trip book person, so that's saying a lot), Reagan and her determination, Matt. . . I absolutely loved every bit of it, and I'm glad I listened to people telling me it was so good! I'm so sad that I didn't love this book as much as everyone else has. I was really looking forward to it, but I couldn't stand Reagan half the time. I thought she'd be a refreshing change of pace from the usual YA girls but she ended up being too hypocritical and judgmental. Otherwise, I loved the romance and friendship themes. Great review! You and I both know that I loved Open Road Summer! We made a brilliant life choice in reading it spontaneously (Thank you Judith, for inspiring that! ), and I really think it worked out in our favor. A great story, a wonderful friendship and a swoon-worthy romance? TOTALLY AWESOME. Oh Matt Finch. Forever hearts in my eyes for him. I just want him..Now. In a non-creepy way. 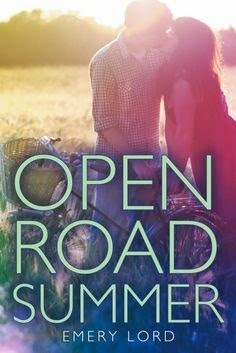 I think I need to read Open Road Summer like right now!